GAZA CITY, Gaza Strip (AP) - A rocket fired from the Gaza Strip on Monday was one of the most powerful launched ever by Gaza militants, flying nearly 120 kilometers (70 miles) before it slammed into a house in central Israel, wounding seven people. 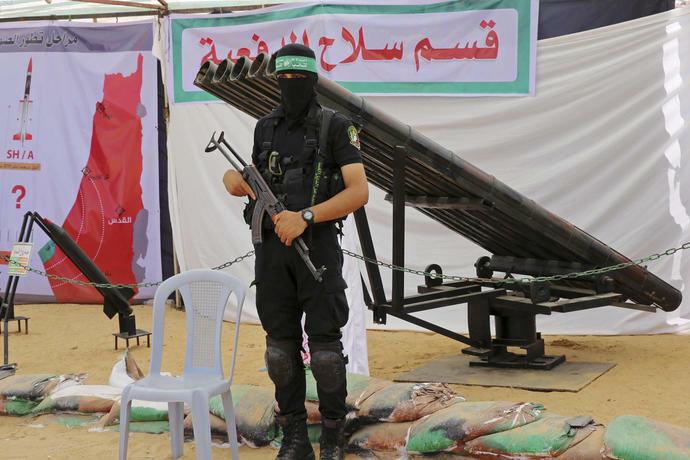 Hamas seized control of Gaza in 2007, prompting Israel and Egypt to impose a blockade on the territory, largely to prevent the militants from amassing more weapons. But the blockade and three wars with Israel - the most recent in 2014 - failed to prevent Hamas from expanding its arsenal. 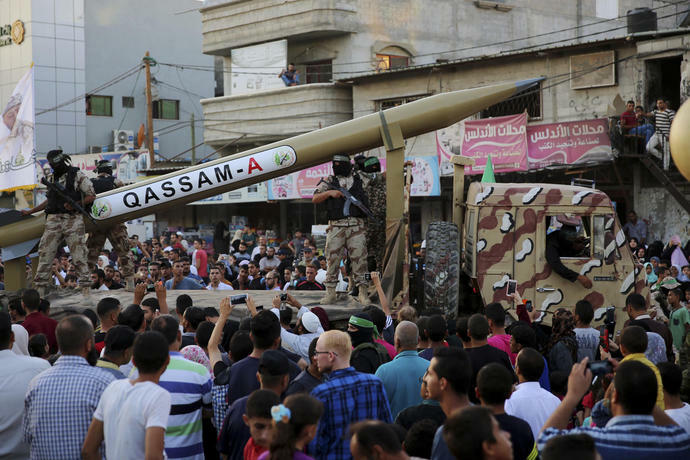 -Qassams: In 2001, a year after the outbreak of the second Palestinian uprising against Israel, Hamas first fired a cross-border rocket toward Israel, calling it "Qassam" after the group's military wing. The homemade rockets, aimed at Israeli border towns, had an irregular trajectory and sometimes landed inside Gaza. 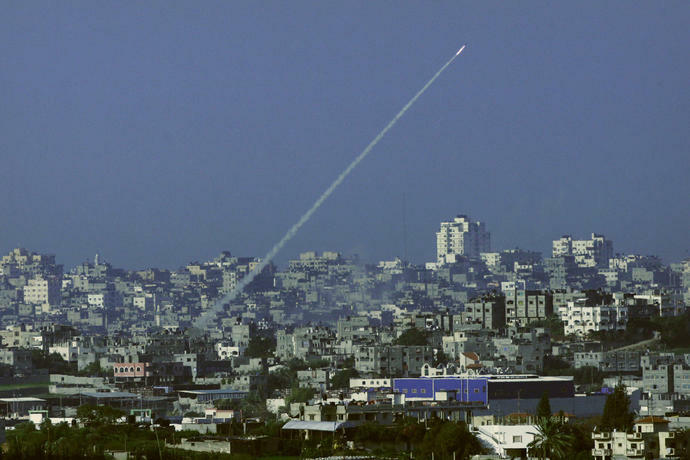 -R-160: Hamas calls this its longest-range home-grown rocket. It was first fired in the 2014 war and at one point hit Haifa. The "R'' in the name refers to Abdel-Aziz Rantissi, a senior Hamas official who was killed in an Israeli airstrike in 2004. The number refers to the range, in kilometers. -J-80: This rocket, also produced locally, is named after Hamas military wing commander Ahmed Jabari, who was killed in an Israeli airstrike on his car in 2012, setting off an eight-day war. Israel reportedly believes the rocket that hit central Israel on Monday was this model and blamed Hamas. The group has not claimed responsibility. -M-75: Hamas unveiled this rocket in 2014, claiming it was homemade. But experts believe it is a version of the Iranian Fajr 5 rocket, which Iran acquired in the 1990s and is based on Chinese technology. -Hamas also possess a variety of Russian Grad rockets. These projectiles, with a range of about 20 kilometers (12 miles), are believed to have been delivered via Iran. -Mortars. Hamas has fired hundreds of mortars at short-range targets just across the border. The mortars are believed to have been smuggled from Libya through Egypt. - Laser-guided anti-tank missiles made by Russia. Last November, Hamas fired such a missile, known as Kornet, at a bus from which Israeli soldiers had just exited. One soldier was seriously wounded. In a 2006 war, the Lebanese Hezbollah militia killed dozens of Israeli tank soldiers using these weapons. -Drones: Hamas has developed an early-stage drone program, displaying images of Israeli fields purportedly filmed by these aircraft. It's not known whether they have been used for attacks.